To hear Marty Nelson tell it, nothing says “Happy Birthday” or “I Love You” or “It’s a Girl” or “Welcome to the Neighborhood” like a bundt cake. Lucky for you, she offers the perfect way to deliciously pass on any of these greetings — and dozens of others — via her business, Nothing Bundt Cakes. The storefront and bakery on Magnolia Drive near Apalachee Parkway has perfected the bundt, offering 10 fresh-baked flavors in a variety of sizes. There are lighter cakes, like the Classic Vanilla and Lemon, as well as decadently rich options including Chocolate Chocolate Chip, Red Velvet and Carrot. There’s also a special flavor each season. For Valentine’s Day and Mardi Gras in February, it’s Chocolate Peanut Butter Swirl. All feature a cream cheese butter frosting generously applied in a unique “petal” design or a lighter drizzle. The 8-inch size serves eight to 10 people while the bigger 10-inch cake will satisfy a crowd of 18 to 20. There are single-serving “Bundtlets” and bite-sized “Bundtinis” sold by the dozen. 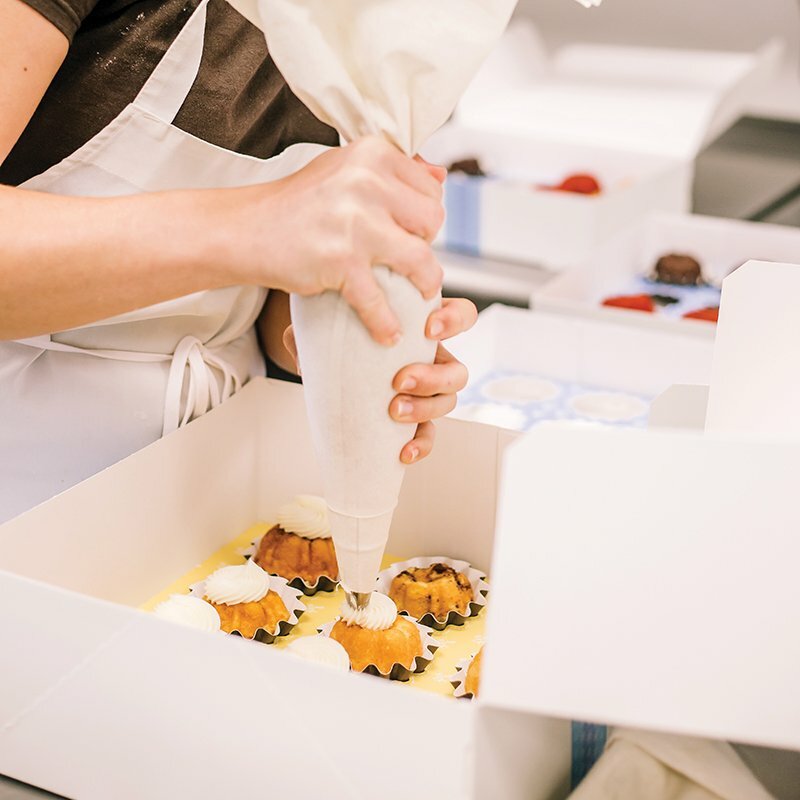 The top four flavors are always available for grab-and-go from the case, but with a short wait, any cake can be “frosted up fresh,” says Nelson. For the fastest service, she suggests ordering a day ahead by phone or online. Delivery service is also available. The business features the fabulous fragrance of fresh-baked cakes as well as party supplies and cards, and giftables from companies such as Tallahassee-based Coton Colors, Kate Spade and Mud Pie. “We are kind of a one-stop shop if you need to pick up your balloons and packages of serving supplies and your card, maybe a small gift … we offer it all,” she says. Many languish in the cupboard, unused by cooks who aren’t confident their cakes won’t stick to the pan’s nooks and crannies. Nelson can relate — and promises her cakes are flawless. “We eat a lot of cake if it doesn’t come out right,” she says. “We believe wholeheartedly that everything that goes out of here has to absolutely look perfect.”While one might think the classic sculpted cake is an import from the Old Country, the signature bundt cake pan actually was created in the U.S. in 1950, reports foodandwine.com. A Hadassah Society wanted to recreate a traditional kuglehopf, a ring-shaped cake, and asked David Dalquist, who owned the Nordic Ware, to design a pan. Demand grew slowly over the years, but took off in 1966 when a bundt — the “Tunnel of Fudge” cake — won second place in the Pillsbury Bake-Off. According to the site, more than 70 million households have a bundt pan.